Bruce Jason has a doppelganger, an exact double. The identity of that man is the key to this case about murder and foreign intrigue, which revolves around a struggle for possession of the supposed diary of a certain Iron Curtain dictator. + Winston Churchill coined the "Iron Curtain" phrase in a 1946 speech in Harry Truman's Missouri. Mike Bedard 6.1.16. Hugh O�Brian stars in a double role, playing both Bruce Jason, the lawyer who defends Elihu Laban in a murder trial, and one of the murderers who killed two victims. Automobiles Supplied by � Ford Motor Co. Location: The Laff in the Dark ride featured in this episode was at the Long Beach Pike. The �airport protest� scene was staged outside the lobby of the Long Beach Arena, a few blocks from the Pike. Show pictures here. Submitted by D. A Supernaw, 6/21/2005. Goof: When Elihu meets a former agent, the latter repeatedly mentions the Tunnel of Love as the ride in which a certain transaction will take place. However, it is not the Tunnel of Love but rather Laff in the Dark (see above), which is more of a light horror show, not at all romantic. Submitted by gracep, 1/27/2011. Uncredited Actors: At the airport, Don Anderson appears momentarily as a uniformed cop standing behind Lt. Tragg. Bert Stevens is one of Schreck�s (Charles H. Radilac�s) bodyguards, clearly visible as they are leaving the terminal and later as Schreck boards the Laff in the Dark. (He could, however, be a plainclothesman.) And Sgt. Brice (Lee Miller) is among the plainclothes contingent escorting Schreck. Submitted by gracep, 1/27/2011. + Anderson also appears very briefly as one of the line of officers providing security at the amusement park. Submitted by FredK, 27 January 2011. + From Melvin Nimoy i know nothing, but i am convinced there is shared DNA there. That hairline! Submitted by catyron, 05/05/18. Sightings: Several favorite frequent faces turn up for this hearing of international import: �Miss Carmody�, Pencil Mustache Man, Distinguished Gentleman #1, and the Little Old Lady in a Hat. Read more about why we are spotting these people here. Submitted by gracep, 1/27/2011. + Continuity Error: At times, those last two spectators magically teleport from one side of the courtroom to the other, from one cut to the next. Submitted by gracep, 1/27/2011. to the Right of Della's Right Elbow in the last image (from ep#127). In addition to the original Ep#118, these things have now turned up in Ep#s 127, 152, 166 and this Ep#171. Added by Gary Woloski, 8/15/13. Location: The porch of a house with the address of 1432 is used for scenes at the Laban residence as well as a scene in #218, TCOT Bullied Bowler. I don�t know what street this was but the 1400 block would be just a few blocks north of the studio in Hollywood. Submitted by Eric Cooper, 28 April 2011. + It also serves as Floyd Grant�s house in #167 TCOT Bluffing Blast. Submitted by gracenote, 7/25/2011. �Didn�t Papa Bear want to see Disneyland?� asks Anderson. He�s referring to Soviet Premier Nikita Khrushchev, who visited the US in September 1959. He was supposed to visit Disneyland, but because of security reasons, it was skipped. Submitted by gracenote, 7/25/2011. Nice try by the producers to insert the recuperating Mason into this episode: His scene �together� with O�Brien�s character was shot separately. Note the different lighting and the fact that they never appear in the same shot. Submitted by Francis, 12/11/2011. 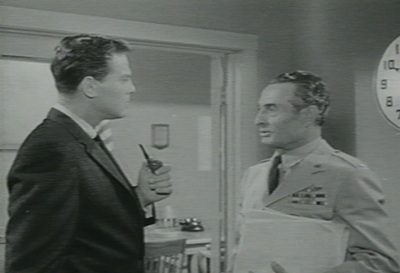 Robert F. Simon and Werner Klemperer both appeared in episode #27, 1958's TCOT Desperate Daughter. Submitted by Wiseguy70005, 6/25/12. "T.V. Reporter", played by Henry Travis, is the TV reporter holding the microphone (it looks like the same microphone as "Commentator" had in Europe!). He asks the first question when Laban comes out on his porch. I could find only one image of Henry online: here he is as "Colonel Frogley" in The Brain From Planet Arous (on youtube, 1:11:04). He looks much better in this episode than he did in The Brain! Henry Travis also appears in ep#s 183 & 222. "Reporter No. 2", played by Walter Mathews, is the second of the reporters to ask Laban a question. 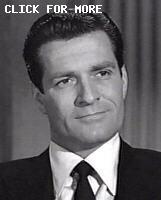 Mathews makes five more credited appearances in Perry Mason, mostly as newsmen. You may remember him from later years giving you advice about oil filters. Their voices impressed me and I wanted to know who was who. Added by Gary Woloski, 8/27/13. +William Woodson was the Narrator for "The Winds of War" & "War and Remembrance" mini-series. Mike Bedard 2.5.15. CARS. The car identifications are somewhat uncertain because, other than for the two '63 Ford taxis, the camera did not catch much sharp, identifiable detail on the vehicles in this episode. (1) A light-color 1963 Ford Galaxie 4-Door Sedan SUNSHINE Taxi, Lic No YLH 025 (yellow-plate, numerals indistinct). Following the opening newscast from Europe, the taxi takes Zenas from the "airport" to Laban's house. Zenas also makes two more trips in it later. The taxi's apparently blacked-out high-beam headlights indicate that this car probably left the factory as a police special, see Comments section. Rates painted on the front door are the same as previously seen in the series: "25� first ⅕ mile, 5� each additional ⅕ mile". (2) A KNXT remote broadcast unit is stationed at Laban's house when Zenas arrives at 1:43. Watch the background as Zenas exits the taxi and read "KNXT CHANNEL 2" on the van's side. It's a special-purpose Step Van similar to this with an opened cable bay in the rear, like this. The TV industry calls this an Outside Broadcast or OB Van. The TV camera on Laban's front lawn is also marked "KNXT", like the camera pictured here at the CBS Television City ribbon cutting, 15 Nov 1952. More on KNXT in Comments section, below. (3) Rear view of a light-color 1962 Mercury Meteor 4-Door Sedan approaching the amusement park at 11:00. It might be Laban's car but, if so, why are there two people in it? In the next shot Laban is walking to Laff in the Dark alone. It could be a '63 Meteor but it's more likely to be the same '62 Meteor that appeared in ep#s 169 &170. (7) An indeterminate large, black, US-made luxury sedan that looks most like a 1963 Buick Sedan is behind Schreck's limo (problem: Buick's 3 or 4 venti-ports seem to be invisible). The car's shape is also right for a '63 Oldsmobile but the front bumper looks wrong. (8) Paul & Della are tailing Zenas in Paul's black 1962 Thunderbird Convertible (top down) at 40:42. Not enough of the car is shown to distinguish it from a '61 or '63 TBird so I rely on series context for the year identification (eg, Paul's TBird in ep#174 is indubitably 1962). Background Cars. The other light-colored taxi that appears in the background at least once is also a 1963 Ford Galaxie 4-Door Sedan. An inter-city bus of unidentified make/model/year/livery is the backdrop to Schreck standing by his limousine at 14:38. Added by Gary Woloski, 8/30/13. The TELEVISION CAMERA deployed by the KNXT NEWS mobile unit is almost certainly an RCA TK-30 or, alternately, a TK-10 or TK-30A. The TK-10 and TK-30 were both introduced into service in 1946 and were virtually identical in external appearance. The TK-30 was the field version of the TK-10 but was also used in studio. These cameras were used until at least 1964, as confirmed at eyesofageneration.com (scroll down to "CBS Section", look for Jackie Gleason). Also look for CBS network president "paint em grey" Frank Stanton who ordered that RCA insignia be removed from CBS cameras and that they all be painted a uniform grey. Photos of a surviving example here. Added by Gary Woloski, 8/26/13. Goof: Schreck was supposed to enter the amusement park at noon; but by the shadows seen at 14:54, it must be sunrise. It just dawned on me that they must have filmed the amusement park scenes early in the day, before the park opened to the public. --submitted by 10yearoldfan, 15 November 2013. Interesting that Hugh O'Brien's Bruce Jason has to explain the meaning of the word doppelganger to Werner Klemperer's character when the actor was born in Cologne, North Rhine-Westphalia, Germany, and fled Nazi Germany in the 1930s. This episode may hold the record for the most actors with multiple Perry Mason appearances. In the first scene on the yacht with 6 actors, one actor had 2 appearances, 2 actors had 3 appearances, one had 6 appearances and two had 7 appearances! And that is not counting Werner Klempler who appeared 3 times. In 1949-50, CBS programming was carried by network affiliate KTTV Ch11, Los Angeles. In 1950, CBS sold its 49% interest in KTTV and bought KTSL from Don Lee Broadcasting. CBS-owned-&-operated KTSL Ch2 took over full CBS programming on 1 Jan 1951. On 28 Oct 1951 KTSL changed its call-letters to KNXT, a common-sense change to conform to the call-letters of KNX, the long-established CBS Radio Network station in Los Angeles. On 2 Apr 1984 KNXT changed its call-letters to KCBS-TV (partial ref: wiki article). from the early '60s, with KNX Radio at CBS Columbia Square, 6121 Sunset Boulevard. KNXT was a pioneer in expanding television news coverage. Before the '60s, news coverage on television was extraordinarily sparse, amounting to an hour or less per day on any given channel. Innovation came in 1961 when KNXT expanded its evening local newscast "The Big News" to 45 minutes, being the first station in the US to do so. In 1963, KNXT further expanded "The Big News" to an hour. I recommend Bill Harvey's article 'The Big News' was big news in broadcast world, Los Angeles Times May 22, 2011. Submitted by Gary Woloski, 8/22/13. Must say, Hugh O�Brien looks mighty tasty in that shredded shirt! And Lt Anderson stole Paul Drake�s �one way ticket to the gas chamber� line. The Summary gives away way too much information. It shouldn't mention "doppelganger" at all. Submitted by 65tosspowertrap, 11/13/2013. Yet another episode in which the very traditional courtroom set bears no relation to the contemporary court building exterior. Frankly ridiculous that a visiting official would be visiting an amusement park like this, going on rides by himself. "The Office of Strategic Services was initiated by General William J. Donovan with the approval...of President Franklin D. Roosevelt to...provide intelligence needed for wartime activities...Branches of the OSS included SI (Secret Intelligence), SO (Special Operations), OG (Operational Groups) & MO (Morale Operations)," www.ossog.org states. CIA.gov observes that OSS employed 13,000 (including 4,500 women); 7,500 served overseas (including 900 females) & the agency spent $135 Million during its 4 years of operation. Following OSS's post-war disbandment, the National Security Act of 1947 created the CENTRAL Intelligence Agency as our 1st Permanent, Civilian espionage entity. Mike Bedard 2.7.15. +She's also beautiful when she's not angry, but not even her presence can salvage this gobbler of an episode. Submitted by BobH, 5 March 2017. The "Blacked-Out" headlights on the taxi, Car(1), are probably high-beam headlamps with high-color-density RED lenses. A few references I've found (police car photo books, etc) indicate that circa-1962/63 a few US states allowed emergency vehicles to use warning-light systems of this nature. The low-beam (uncolored) and high-beam (red) headlamps would alternately flash. Added by Gary Woloski, 11/13/15. Learning from the Master This is perhaps the series' purest example of a MacGuffin: we hear about the Volney Papers - God do we hear about them...over and over again !! - but we never really learn what's in them or if they're as important as everyone thinks. Submitted by Notcom, 030916. FORT DIX, NJ was mentioned as the starting point for the OSS operation: PFC John F. Bedard met Margaret Tighe at a FD dance and later married. Mike Bedard 5.28.16. "A Case of (Mixed-Up) Identity." Just to add to the infinite confusion of this episode's plot, it would have been appropriate if it had been revealed in the epilogue that the killer was actually Earl Mauldin in disguise. (See Episode #74, TCOT Startled Stallion.) Submitted by BobH, 5 March 2017.